The design and build of your landscape should always be handled by expert professionals in the field. Once all the landscape features have been installed as per the plans provided by the designers, it is also very important ensure that all the areas are maintained with regularity. Lack of maintenance can result in early deterioration of your landscape. Regular wear and tear as well as exposure to the elements can cause various features to start looking old and become damaged quickly as well. This is where our landscape maintenance services come into the picture. We at Piracci's Landscaping, Inc. are a leading company in the landscaping space and cater to companies in and around Abington, Bedminster, and Buckingham. We maintain small and large landscapes throughout Center Valley, Chalfont, and Coopersburg. Our consistently high-grade yard maintenance solutions have helped enhance the appeal and value of properties in and around Doylestown Dublin as well as Hatboro. 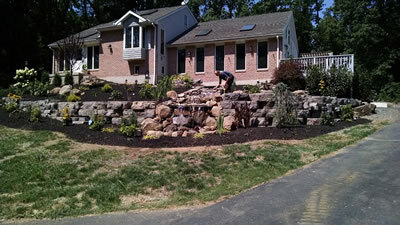 Many clients in Huntingdon Valley, Lederach, and the surrounding areas trust only us for all their landscaping needs. We use a variety of organic fertilizers, insecticides pesticides and other plant care products in our work. This goes a long way in maintaining the health of all the living features in your landscape. Maintenance of outdoor features such as pergolas, decks, patios etc. While masonry elements are hardy, they need regular cleaning and care. We use non-toxic cleaning agents in our work and make sure that every feature is installed methodically and with attention to detail. We use the best quality sealants for all the paved areas and this helps prevent the surfaces from becoming stained, scratched or dirty. We understand that every landscape is different, which is why we go the extra mile to custom design landscape maintenance packages for our clients. These would take into account the specific features, plantings, and trees that you have on your property. Our customized and professional approach, reliability and top quality customer service set us apart from other operators in this space. If you are looking for a company that provides excellent landscape maintenance services, Piracci's Landscaping, Inc. is the company to call. Feel free to call us at and discuss your project details with your clients. You also have the option to send us queries via this Contact Us form and we will respond quickly.